Situated just a block west of US HWY One on Marcinski Road you will find The Villas of Ocean Dunes Jupiter. The 24 hour manned gate at the Villas of Ocean Dunes offers security for homeowners looking for a gated community. There are nine different townhouse floor plans ranging from 1400-1800 square feet in living area. One and two story townhomes are available.Three hundred units comprise this beach area, gated community in a sought after location. A Cape Cod like design, it's a wonderful mix of tropical beach area living and a hint of New England relaxation. 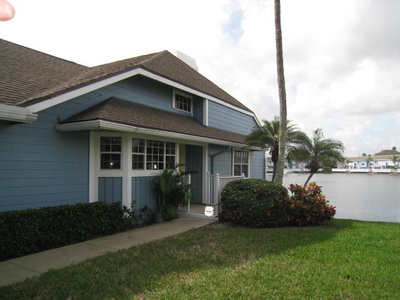 It is located adjacent to the Ridge at The Bluffs a popular single family beachfont community. Villas of Ocean Dunes was built in two phases. Phase One consists of homes that have fireplaces, no garage. Phase Two consists of homes with garage but no fireplace. An interior lake is the central focus with adjacent pool and cabana area as well as racquetball and basketball courts. Some of the most desirable units are lakefront with exterior deck/patios extending to the lake that make additional outdoor entertaining areas. The lakefront units are rarely on the market for more than a few days. At night the lighted Palm trees around the lake make a beautiful view. The location gives way to easy walking access to Jupiter's finest beaches and is just a stone's throw from Juno's Loggerhead Marinelife Center. Additionally great shopping and restaurants as well a major malls, roadways and hotels are a five minute drive. A pet friendly community, the Villas of Ocean Dunes allows up to two pets for owners only with a unlimited weight restriction. There is an onsite property manager. Renting is permitted with a three month minimum lease period up to three leases per year. With it's great location and moderate price range it is definitely worth looking into. The Villas of Ocean Dunes is surrounded by Divosta Bluffs condos, townhouses and single family homes. The Bluffs of Jupiter are very popular communities that are known for the well built construction. With oceanfront condos or marina views there is a perfect place for you. Beachcomber condos on the beach are another popular beachfront community in Jupiter. Call us to help you start your search for a beachfront vacation home to spend next winter in. We also sell Jupiter Beach homes as well and do go North or South of here and cover Singer Island waterfront homes for boaters and beach people. If a Villas of Ocean Dunes Condo listing has caught your eye or you want more information about Jupiter, FL homes, please don't hesitate to call 1-561-744-7025, or email via our handy contact form with any questions or to arrange a showing.